Philadelphia Marathon 2016 was a success! I did not run this year but ran part of the race with my sister. It was a weekend to remember for the runners! We left Boston on Saturday morning and had a relatively easy drive through CT, NY, NJ, and then PA. Adele’s “Hello” blasted through the car speakers a minimum of 8 times. My sister’s husband and Mark dropped my sister and me off at the PA convention center for the expo. We met my cousin, her boyfriend and their friend who were also running the marathon there. We all checked into our air bnb south of Rittenhouse Square in Philadelphia and we all loved it. Air bnb is the way to go, particularly in cities with expensive hotels. We were able to cook a big pasta dinner with some salad and hang in for the rest of the evening. It was early to bed for all of us! The runners woke up at 4am, had their breakfasts and coffee, and were off in a cab by 5am. I was able to sleep in a bit with the non-runners. I decided to meet my sister at mile 13.5 (after the crowded half way point), and do my 15 mile training run alongside her. However, she was running so fast that we only ended up running a few miles together! 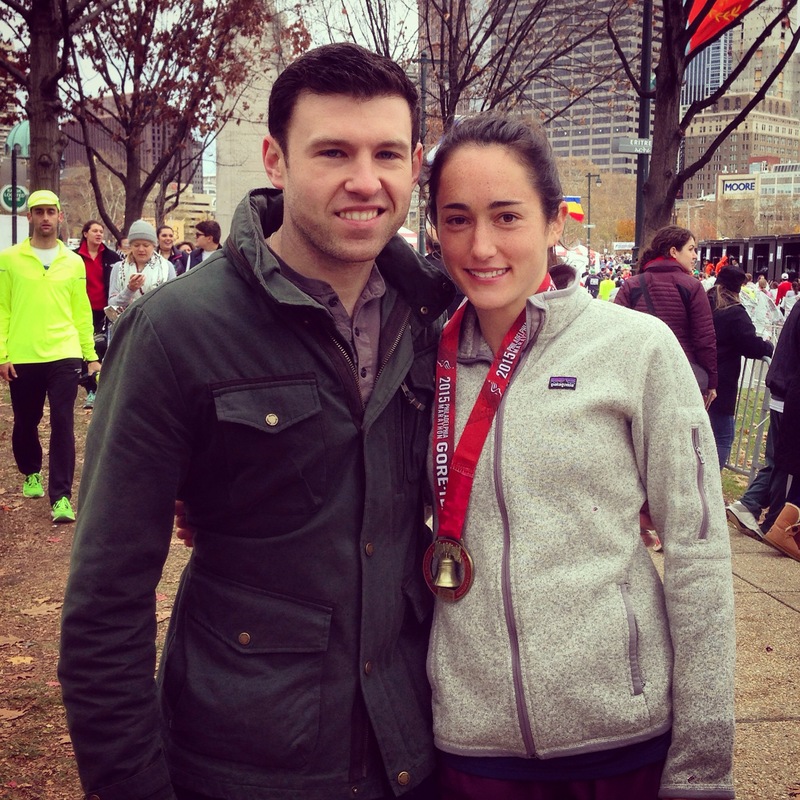 My sister ended up running a PR and qualifying for Boston with a finish time of 3:23!!! She is a rock star. My cousin and her boyfriend also did amazingly well for their third and first marathons respectively! My sister trained hard, but she also had a good plan for race day and got a nice boost from the weather as well. Race nutrition is important. This is the first race where she had generation Ucan before the race. She also had one and a half bagels with light peanut butter for breakfast and three GUs throughout the race. She felt really strong throughout – light enough, but enough nutrition and energy to keep her going. The weather was ideal for a marathon—upper 40’s, light breeze, cloudy. On the cool side for spectators but perfect for a PR! I wore my long sleeve, compression socks, and shorts with gloves, but quickly took off the gloves and carried them for the rest of the race. Going out slower, especially in the hilly sections of the race, is a key to success. My sister did not burn out towards the end, instead she picked up her speed! She ended up running a significant negative split. Running with others beats running alone! I hope I helped my sister while I could keep up with her (at least she said I did). I should also give a shout out to my cousin and her boyfriend because they ran together the whole way! I was able to get some great pictures too since I wasn’t so focused on how fast I was going! Just by trying to keep up with my sister, I think I got an (unofficial) half-marathon PR! Post-race meal choices matter- we weren’t disappointed. My sister’s performance was really inspiring so I’m looking forward to training hard and doing my best in Phoenix!! Have a wonderful Monday guys! Hope your races/runs/weekend plans went well! What do you eat before and during a race? What are you most excited about in the week ahead (besides eating all of the delicious Thanksgiving food)? It was a great time! Have you run Philly before? I eat like I’m 8yrs old so I’m a big fan of Mac and cheese the night before and a peanut butter and jelly sandwich a couple hours before the race. During the race I fuel / hydrate w/tailwind. That all sounds delicious! What do you typically fuel with during a race or long run? I used to take a PBJ and cut into squares and eat a couple of those, and a GU, every hour, but since early last summer I just drink Tailwind – http://www.tailwindnutrition.com It’s replaced my GU gels and GU brew tabs. That’s all I consumed during my 8hr 50k over the summer. During a race i like GU and honey stinger gels the best. This week i am most excited about meeing my bf’s family! Big step! Also we will get 6 hours round trip together in the car which i am sadly super excited about because he has been working so much lately hahahaha! That sounds great– I am going to try the honey stingers soon. my coaches highly recommend them! Sounds like a fun week meeting your guy’s family. Have a blast! Cool! I live in NJ pretty close to Philly. I ran my first half marathon this year and am thinking of running Philly as my first full. We shall see! P.S. Love the Liberty Bell medals! I am so proud of you and Beth for your PRs!!! That’s awesome! Before race: peanut butter on half an english muffin and a banana plus water, coffee, and half a gatorade. Can’t wait to have some quality couch time with Christmas movies with pie :) And to go for a Thanksgiving morning run in my hometown, of course! I usually use gels during a race, but have also used Tailwind and other foods and drinks. I used Gen UCan before a 20 mile run for the first time this week. During the run, I ate one GU gel. Congrats to your sister on her fast race finish! Previous Previous post: Road-tripping to Rocky!